Between my wife and I, we now have over 30 credit cards in our wallets. That might seem like a lot to the average person (and it is) but the sign-up bonuses from these cards have allowed us to stay at some pretty amazing properties for next to nothing. In the past year alone, we’ve stayed 4 nights in an ocean front suite in Kauai for absolutely nothing and we got to experience some of Europe’s finest hotels during our honeymoon at more than 75% off. Most people dismiss our success or argue that it can’t be good for your credit. But these people have no idea what they’re talking about since my credit score currently sits at 799 and my wife’s is above 750. It’s definitely some work keeping track of all of the latest offers and managing all of our cards but it’s something that I truly enjoy. The toughest part about racking up all these miles and points though is knowing how and when to use them. Today, I’m going to give you guys a little insight into everything that goes through my head when I need to book a hotel room. In addition to getting married this summer, I’ve actually attended three other weddings too. And even though wedding season is coming to an end, we still have one last wedding in San Diego in October. The actual ceremony and reception are at Paradise Point, a really cool resort that’s all alone on a peninsula in Mission Bay. I’ve always wanted to stay here since most of the rooms are overlooking the bay and the grounds are very tropical but all those amenities also come at a price. Even for an off-season wedding block, the room rate was still just over $200/night. Add on a ridiculous $24/night resort fee, taxes and $29/day for parking and you’re going to be paying close to $300 for less than 24 hours of fun. It’s always more convenient to stay at the wedding block hotel but I generally don’t like to spend more than $150/night if I’m going to do so. Since most of your time is taken up by attending the wedding, you’re really only paying for a place to sleep. And I don’t think it makes much sense to pay for a fancy room if you’re not even going to get to enjoy it. The first thing I did after deciding that $300 was too rich for my blood was take a look at all my points balances in Award Wallet. It’s always important to know where a majority of your points lie. And even after my European honeymoon, I’ve still got quite a stash built up. Checking the balance of your hotel programs accounts (Starwood, Hyatt, Hilton, Marriott, IHG, etc) is pretty straightforward but don’t forget about the transferable points networks like Chase and Amex. I am a big fan of Chase Ultimate Rewards (UR) since you can transfer points to hotels like Hyatt and airlines like United and Southwest. If I can’t find a major hotel chain with availability, I will often turn to my Barclay Arrival Card since I usually have a stockpile of points there that can be redeemed for travel awards. This card is great to use when you have to pay for small boutique hotels, hostels and things of that nature. I’ve also had a ton of success in the past with VRBO and Airbnb (though there are some things you should watch out for). Generally, any time you have more than 2 people and/or a stay of 2 days you will probably come out ahead booking via one of these two services. I usually save my hotel points for solo stays or stays with my wife. But when we travel in groups to events like weddings, that is the perfect time to take the lead and book a house via VRBO or Airbnb. I have stayed in some absolutely beautiful homes that were 10 times nicer (and a lot cheaper) than any hotel. If you use a card like the Barclay Arrival, you’ll also get 2% cash back on your AirBnB purchase. 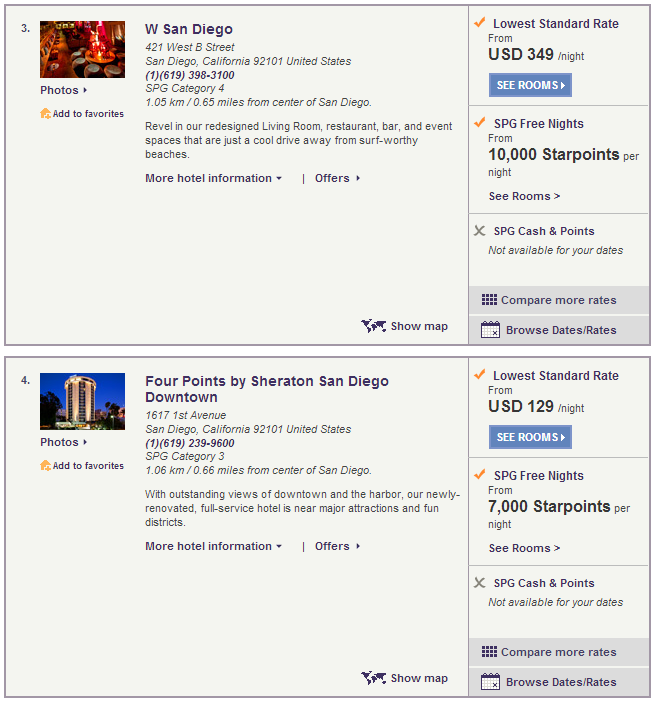 The cool thing about searching for rooms these days is that you can just log on to Starwood’s website for example and select pay with points, enter your dates and city, and it will pull up all of the Starwood properties in San Diego. So you really only have to do a few searches in order to see what kind of availability there is and how many points it’s going to cost you. 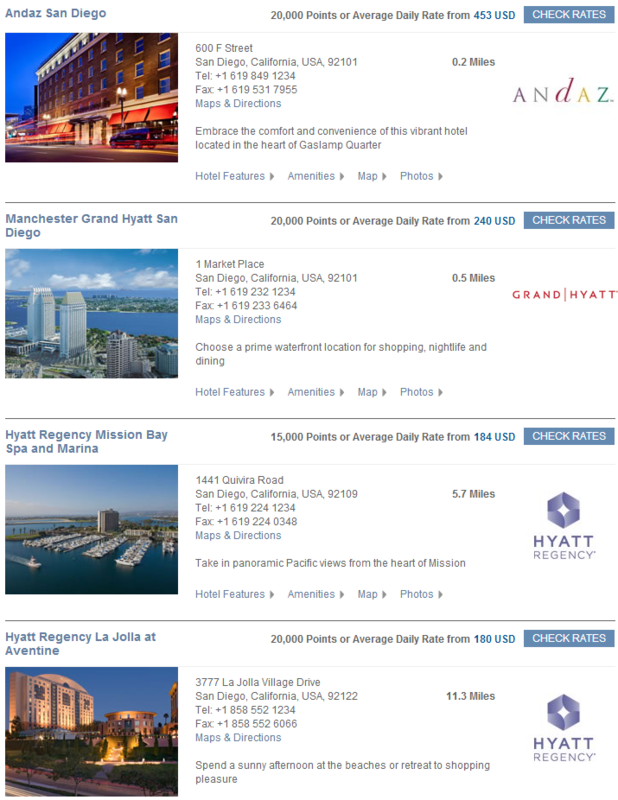 Alternatively, you can also use a site like AwardMapper to search for hotels and sort by award programs. Hat tip to Cash Cow Couple for the tip about AwardMapper. Hilton hotels generally have pretty poor redemption rates and in this case, they only had one hotel within 10 minutes of Paradise Point (and there was no points availability). There was a hotel a little further away in Mission Valley (my old home!) but that was about 15 minutes away and nothing special. Starwood has done well for me in the past and I usually get 4-5 cents per point in redemption value. They are my go to hotel chain in Europe when I want to pay with points since you can stay in some absolutely beautiful rooms for a fraction of what they cost. In the US though, I haven’t had as much look booking Starwood properties. I like the W and Westin brands but they always seem a little over-priced to me. There was a lot of availability at properties around San Diego but nothing was super close to Paradise Point. I also couldn’t find any cash and points redemptions which are my preferred redemption option. The best option I found was at the W San Diego for 10,000 points a night (advertised rate of $349/night). This would be a great redemption rate but wouldn’t really make a whole lot of sense for this stay since we want to be near Mission Bay. I only have a couple thousand points in my Hyatt account but I do have 70k in my UR account and 70k in my wife’s account. You can transfer points instantly from Chase to Hyatt so those points are very valuable to me. I was fresh off a great experience at the Grand Hyatt in Istanbul so I had a feeling Hyatt would be my winner. Sure enough, they had a nice property about 5 minutes away on Mission Bay. I actually went to a wedding at the Hyatt Regency Mission Bay a few years ago but didn’t get a chance to stay there. The room rate was $184 or 15,000 points so not the best redemption rate but it was a heck of a lot better than paying $300 for a room at Paradise Point. Although, this Hyatt property charges a $19 resort fee and $29 to self-park or $34 to valet park your car. Since there isn’t really anyone I can run these deals by, the last thing I like to do is go on to Flyertalk and see if there is a thread dedicated to the hotel in question (this is usually the case for most big hotels). Sure enough, I found a thread for the Hyatt Regency Mission Bay and after reading a couple pages I noticed one poster talk about a free night certificate they used. Bingo! A light went off in my head since I too had a free night certificate coming up in September that I could use. I signed up for the Chase Hyatt card last year and they gave me two free suite nights (since I had status matched to platinum at the time) and a free category 1-4 night certificate on your 1 year anniversary. A lot of these hotel cards like to market a free anniversary night but generally they are at lower to mid tier properties so they can be a little tough to redeem. I usually get a little payback though since I wait until the free night is deposited and then cancel the card and get the annual fee refunded. In this case, the hotel I wanted to stay at (Hyatt Regency Mission Bay) was a category 4 property though so I was able to use my free night certificate. The other cool thing about paying with a free night certificate (with Hyatt at least) is that you don’t have to pay the resort fee. So as long as we don’t order any late night pizza after the wedding, all we’ll have to pay for is parking. I ended up booking a garden view room with a king bed and saved a ton of money. It would have cost me almost $300 to stay at the wedding block hotel or $200 if I had paid cash for this room at the Hyatt. Instead, I paid $0. I’m still not sold on paying $34 for valet parking but maybe I can find some street parking and use Uber or Lyft to get to the wedding. Nice work!! First off, I wouldn’t have a problem with the 34 credit cards.. I’ve been there for the same reasons the incentives and yes if you use them correctly they can help improve your credit score and give you some nice perks. Having so many accounts opening and closing is only really a pain if you are trying to get a mortgage. They have tightened things up a bit and so the less they have to bring up in a report the better. I have dialed mine way back since I haven’t been doing much of that any more. I’ve decided for the most part spending that time chasing after a few hundred bucks is lest important then other things I’ve got going on. But when they are minimal effort I’ll use the benefits. Thanks for all the San Diego info… I am planning to take a trip down that way and you gave me some options of places to look into. I’d probably opt for the hotel down the street as well! I didn’t really believe it at first either but I’m always willing to give something a chance. 30 cc’s later I’ve saved tens of thousands of dollars on travel and have a 799 credit score. I won’t be applying for a mortgage any time soon but if I do, I’ll just slow down my applications since inquiries fall off your accounts after 2 years. There are some great places to stay in SD, although I prefer AirBnb or VRBO for any stay of 2-3 days for 2+ people. It is pretty cool that you have been able to churn credit cards. I’m not good at churning credit cards because a lot of them require that I spend $3,000 in 90 days and I don’t spend that amount of money. If I was able to pay rent with my credit card then I would do it but since I can’t, I really don’t know how to spend $1,000 a month. Ooooh this changes everything! I did not know that. Thanks. If you are transferring UR, you wouldn’t want to book any of those Hyatts on points except the Andaz – the others would be more profitably booked through the chase travel portal directly for less points..
For hotels and flight same price as either Travelocity or Expedia I think it is, usually that’s the same price as the normal rates on the Hyatt website (not my elite rate, etc). For rental cars god only knows where the rates come from – I rented a car with national through the chase portal at 1.25x and the price in $ (ie, pre-converting to points) was less than any other public source I could find. Gotcha. I’ve gotten pretty good cash rates with Costco and Citi has some amazing points redemptions for car rentals. I got 1.6 cents/point value out of my TY points on that same trip to HI. Citi and Chase Portals are the same I think, at least for rental cars, and maybe for flights/hotels too. Just the branding and redemption rates as far as points->$ are different. Costco was quite a bit more expensive for the rental I wanted when I checked. Nice! You’ve got a good system going! We love our Starwood points and have stayed at properties worldwide. We’ve never had a bad experience or a problem with redemption. You’re right that they aren’t always located super conveniently, but we haven’t had too many challenges (plus, we love to walk so we don’t mind if we’re a bit outside of a city center). Thanks for sharing! Yea Starwood has some amazing properties around the world. We just stayed 2 nights at the Excelsior in Rome and 3 nights at the Grand Bretagne in Athens on cash and points. The latter was by far one of my favorite hotels ever and the c&p option makes it pretty much a steal. One of the nicest spas I’ve ever seen! Points and free night certificates are the best way to avoid those damn resort fees haha!